The Moscow authorities have recently launched several new initiatives to help travelers find their way around the city’s subway system, which previously had no English-language signs. The latest innovations are floor markings on platforms and information stands at exits from subway stations. For many years now, Moscow has lagged behind St. Petersburg when it comes to making life easy for tourists, especially where getting around the city is concerned. Whereas the northern capital installed English-language maps, signs and information points throughout its subway system in the late 2000s, the Russian capital’s metro remained a serious challenge for foreign visitors to navigate. 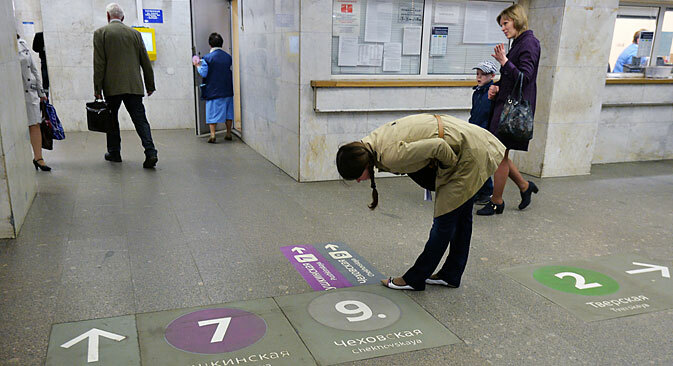 Recent visitors to Moscow may have noticed some signs that change is afoot, however.In many stations of the Moscow subway, signs have appeared on the floor – with large lettering in Russian and English – indicating the direction to follow in order to change lines. Previously, foreign visitors using the Moscow metro had to rely solely upon deciphering the Russian-language signs hanging from the ceilings. However, this new solution has a significant drawback. “The floor navigation is visible only to a small stream of people – fewer than three people per meter. During peak hours, this navigation will simply not be noticed,” said Konstantin Trofimenko, Director of the Center for Urban Transportation Studies. One of the biggest problems for tourists in the Russian capital remains the absence of English translations of the names of subway stations in the station vestibules and on platforms. The Department of Transportation in Moscow has not commented yet as to when this problem will be solved. However, Latin transliterations of station names can already be found in the subway cars themselves. At four of the central stations – Okhotny Ryad, Teatralnaya, Ploshchad Revolyutsii, Lubyanka and Kuznetsky Most – the city authorities have now installed colorful stands at the exits with schematic diagrams of the station’s concourse and surrounding area, which provide information about the main attractions and infrastructural facilities. The schematic diagrams are the work of British specialists from the City ID and Billings Jackson Design firms, who have already implemented successful projects in New York and London. According to Alexei Novichkov, expert at the Design Laboratory at the Higher School of Economics, the design of these information booths raises no objections: The color solutions, font, layout and icons are consistent with international standards. Muscovites and foreign visitors are generally positive about these navigation elements, with most of them citing the numbered exits from the subway as the most useful feature. The fact is that many Moscow subway stations have several exits. One of the busiest central stations of the Moscow subway in particular, Kitay-Gorod, has more than a dozen exits. Previously, these exits were differentiated from each other only with signs in Russian referring to the names of streets and places of interest to which they led – making it easy for tourists and those with poor navigation skills to get confused. Now, when making an appointment to meet a friend, instead of struggling to find the right spot when they tell you: “I'll meet you at the exit to Solyanka Street,” you can just propose to meet under a specific exit number. Foreigners, meanwhile, focus their attention on other elements. “It is good that the new information boards have QR-codes, which can be ‘read’ by smartphones,” says Florentina, a writer from Vienna. But there are also shortcomings. “The English font of the information on posters and in the captions to theaters and museums is too small – you have to come very close to see it well,” she says. Florentina was also dissatisfied with the fact that such posters are not provided at all subway stations: “When I was trying to find Tsaritsyno Park (a museum and reserve in the south of Moscow) at a subway station with the same name, it turned out to be quite difficult,” she says. “There are no maps with landmarks for other areas, such as those already in the city center. There were no clear pointers in the English language, and the passers-by I met did not speak in English, so they could not help me,” she adds. Officials say that the navigation system is gradually being redeveloped and improved. According to Darya Chuvasheva, a press representative for the Department of Transport of Moscow, the introduction of a unified navigation system will take place in stages. “By the end of 2014, the system will first appear on the first subway stations on the Circle Line. By the end of 2015, we plan to install the system at all major stopping points, subway stations and transport interchange hubs,” says Chuvasheva.